David Williamson recently published The 47th Indiana Volunteer Infantry: A Civil War History (448 pages, softcover). Organized at Indianapolis in December 1861, the 47th Indiana Volunteer Infantry’s Civil War service spanned the Mississippi Valley and the Gulf South. From Louisville to New Orleans and on to Mobile, General James R. Slack and the 47th Indiana took the war to the inland waterways and southern bayous, fighting in many of the Civil War’s most famous campaigns, including Vicksburg, Red River and Mobile. This chronicle of the 47th Indiana follows the regiment’s odyssey through the words of its officers and men. Sources include Chaplain Samuel Sawyer’s account of their exploits in the Indianapolis Daily Journal, soldiers’ accounts in Indiana newspapers, stories of war and intrigue from newspapermen of the "Bohemian Brigade," and General Slack’s own story in letters to his wife, Ann, including his postwar command on the Rio Grande. Numerous photographs, previously unpublished battle and area maps, and a full regimental roster complete this detailed account. The Friends of the Indiana State Archives will hold their annual meeting on Tuesday, April 10 at noon at the Indiana State Library in Indianapolis. There will be a business meeting and lecture by author and IU professor Dr. James H. Madison on "Writing A History of Indiana in the 21st Century." An optional luncheon will preceed the meeting - the cost to attend is $15. Luncheon reservations must be made before April 6th. To reserve your seat, contact Connie Rendfeld - phone (317) 232-3694; e-mail carendfeld@aol.com. According to this post on the DearMYRTLE blog, FamilySearch is reporting that 34,000 people have signed up to help index the 1940 census when it is released to the public next week. The blog post also gives information about webinars that will be held each night next week at RootsMagic so indexers can get together and share any problems, insights, etc. they are experiencing. The Indiana Genealogical Society now has 758 databases in the Members Only area. They cover all 92 Indiana counties and encompass 500,000+ records. The Hamilton East Public Library in Noblesville will hold a workshop, "Exploring Free Genealogy Websites," in the library's computer training lab on Wednesday, April 25 from 9:30 am to 12 pm. In this hands-on workshop, you'll learn how to use some of the free websites for genealogy, including FamilySearch.org, FindAGrave, Rootsweb, USGenWeb Project and Google. This is a hands-on workshop and you will have access to a computer, so be sure to bring information about your ancestors. This workshop is free - register online through the library's events calendar, or call their Outreach Department (317) 776-6939. This past week, Governor Mitch Daniels signed into law a bill which would give a judge the power to issue a fine for government agencies found to have violated the state's public access laws regarding records and open meetings (see this article for more information about the bill). Before the judge can even decide whether or not to issue a fine, the state's Public Access Counselor must first issue an advisory opinion about the alleged infraction. An article in Indiana Economic Digest explains the problems facing the Indiana Public Access Counselor. The LaPorte County, Indiana Genealogical Society will meet on Tuesday, April 10 at 7 pm at the Swanson Center for Older Adults (910 State St., La Porte IN). Kathlyn Sonntag will talk about the Bailly Homestead and Chellberg Farm at the Indiana Dunes National Lakeshore and the families who lived there. The public is welcome at all meetings. The society's annual bus trip to the Allen County Public Library Genealogy Center in Fort Wayne is Wednesday, April 18. Paid reservations are due by March 30 -- use the form on their web site (http://www.rootsweb.ancestry.com/~inlcigs/printable.pdf). The blogging world welcomes Ron Darrah! He recently started IndyGenealogy, a blog giving his views of the genealogy world from in and around Indianapolis. Ron is a frequent Indiana Genealogical Society contributor of databases and articles, and he shares his knowledge of all things Indiana (including military records and school records) by giving genealogy talks to groups across the state. 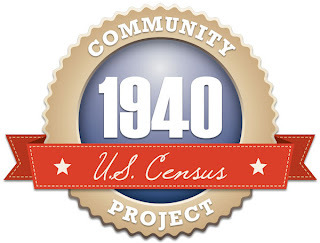 The 1940 U.S. Federal Census will be released to the public on Monday, April 2, 2012. The digitized images will be available for free at http://1940census.archives.gov. --The population of the United States in 1940 was 132,164,569. --3,458,567 people across the country listed Indiana as their birth place. --The population of Indiana was 3,427,796, an increase of 5.8% from 1930. --There were 1,725,201 males and 1,1702,595 females. --1,887,712 people lived in urban areas and 1,540,084 lived in rural areas. --2,597,509 people were born and lived in Indiana in 1940. --712,438 people lived in Indiana in 1940 but were born in another state. --110,992 people lived in Indiana in 1940 but were born in another country. --681,167 pupils attended school, 59% of children aged 5 to 24. --1,151,703 people were employed and in the work force. How are we going to find our relatives among almost 3 and a half million people in Indiana in 1940? Join with the Indiana Genealogical Society and other genealogy societies and organizations to make a free index to the 1940 census. Learn more about how you can help IGS at http://indgensoc.blogspot.com/2012/03/join-igs-in-indexing-1940-census.html. The Indiana Genealogical Society now has 754 databases in the Members Only area. They cover all 92 Indiana counties and encompass 500,000+ records. At last, the 1940 Census will be available for free online on Tuesday, April 2 from the National Archives and Records Administration (NARA) website. Shortly after appearing on the NARA site, the 1940 census will be available at Archives.com, FamilySearch.org, and Ancestry.com. The indexing process will begin immediately, but it will be months before the entire 1940 census index is completed. While you are waiting for the name indices, you will need to search page by page for your ancestors, so The Genealogy Center at the Allen County Public Library in Fort Wayne, Indiana, is offering an "Introduction to the 1940 Census" class to provide information on narrowing your search. Sessions are available on Wednesday, March 28, from 2:30 - 3:30 pm, in Meeting Rooms B & C; Monday, April 2, from 2:30 - 3:30 pm, in Meeting Rooms A & B; and Saturday, April 7, 10:00 - 11:00 am, in Meeting Rooms A & B. For more information, please see the brochure at http://www.genealogycenter.org/Libraries/2012_Brochures/Census.sflb.ashx. Please register for any of these sessions by calling (260) 421-1225 or sending an e-mail to Genealogy@ACPL.Info. The Indiana Genealogical Society now has 753 databases in the Members Only area. They cover all 92 Indiana counties and encompass 500,000+ records. Proper scrutiny of each piece of information in a document is essential to understanding that item’s evidentiary value. Studying every word’s meaning and context ensures that evidence has been properly analyzed and comprehended. Was your ancestor an inventor? Learn how to locate patent records quickly and easily. Patents offer glimpses of creative genius and add interesting stories to family research. Learn how to use FTM for collecting and organizing genealogical info. Then scan and store photographs and records for a future book. Finally, use Microsoft Word to transfer the info from FTM into the book. FEATURED SPEAKER: Debra S. Mieszala, CG is a Certified Genealogist specializing in forensic genealogy, 20th century research, and the Midwest. She does genealogical research for the military to help locate family members of service members missing in past wars, and formerly did adoption-related research as a Confidential Intermediary in Illinois. A national-level lecturer and author, she has taught at the Salt Lake Institute of Genealogy and been published in the NGS Magazine, The Digital Genealogist and OnBoard!. Crucial information on direct ancestors is often found by nosing into the lives of collateral relatives, associates, and neighbors. Case studies present examples of invaluable finds. Thousands of lost soldiers and airmen from past wars were never recovered. Some were missing in action, killed in action, or prisoners of war. Learn about the project that aims to bring them home, and how genealogy is aiding in that effort. Ancestry.com is one of the largest genealogical databases available. Join us in learning how to perform advance search techniques, read the results, and become expert within Ancestry. The Madison County Historical Society in Anderson will meet on Monday, March 26 at 7 pm. The mayor of Anderson will speak on "The State of The City." The meeting is free and open to the public. During the month of March, the Indiana Room of the Marion Public Library in Grant County is offering daily one-on-one sessions on how to use FamilySearch.org. To schedule your session, please contact the Indiana Room - phone (765) 668-2900 ext. 153. The Indiana Genealogical Society now has 751 databases in the Members Only area. They cover all 92 Indiana counties and encompass 500,000+ records. On the 4th Tuesday of each month from 2 to 6 pm, members of the General Francis Marion Chapter of the Daughters of the American Revolution (DAR) will be available in the Indiana Room of the Marion Public Library in Grant County to help you research your Revolutionary War ancestors and get the documentation needed to join the DAR. The next session will be held on Tuesday, March 27th from 2 to 6 pm. For more information, please contact the Indiana Room - phone (765) 668-2900 ext. 153. The Madison County Historical Society in Anderson, Indiana will host a Civil War roundtable on Monday, March 19 at 7 pm. David Fraley will speak on "John Bell Hood's Retreat From Nashville, Tennessee." The roundtable is free and open to the public. The Genealogical Society of Marion County will hold their next monthly meeting on Saturday, April 14 at 1 pm at the Crown Hill Cemetery Waiting Station (W. 34th St. and Boulevard Place, Indianapolis Indiana). Ron Darrah will present a program on "Fraternal Organizations and Their Records." The meeting is free and open to the public; the building is handicapped accessible. The Hamilton County Genealogical Society will hold their next monthly meeting on Wednesday, April 4 at 7 pm in the Carmel-Clay Township Building (107th and College Ave., Carmel, Indiana). Ron Darrah will be the guest speaker, discussing "Using The Records of the Civilian Conservation Corps." The meeting is free and open to the public; the building is handicapped accessible. Looking for information on the divorce of Charles Albert GLESSNER(B-17 Apr 1868 Grant Co, IN) and Nora (SPANGLER)GLESSNER (B-Aug 1879 Grant Co, IN). Married 2 April 1898 Grant Co, IN. I am searching for information on the family of Birdie (not sure if that is a real name or nicnkname) ROSENHAUER who was born in Mount Vernon, Posey County, IN on November 16, 1868. She had an older brother, Edward J. ROSENHAUER, who was said to have been born in New York in April 1865. Their father is known to be Charles ROSENHAUER and the mother is Mary TALBOT. Looking for the marriage record of Edward George WOOD and Olive Edna SHERBONDY m. Abt-1874 at the Quaker Mississenawa Meeting. Edward was a pastor at the Mississenawa Meeting. I'm working on my Sherbondy Line. Looking for Information on Alfred Ray BOZARTH, his parents were William and Estelle Vanilla (MARCUM) BOZARTH. Alfred always said he was raised in Richmond, Wayne, IN. Would there be any record of the schools he attended? He married early and divorced in 1951 at the age of 19 in Wayne County Indiana. Alfred died 2008 in Texas. Author Rick Bell will present "The Great Ohio River Valley Flood of 1937" at the Thursday, April 5 meeting of the Southern Indiana Genealogical Society. Meeting time is 7 pm in the small meeting room of the New Albany-Floyd County Library, 180 W. Spring St., New Albany, Indiana. Bell will share stories, facts and photographs of the flood and the citizens who met the challenge and triumphed over the area's worst natural disaster. He grew up hearing accounts of the flood and spent years collecting stories and photographs of the event. He is the author of The Great Flood of 1937 -- Rising Waters, Soaring Spirits, the first book-length study of the tragedy since 1937. The Indiana Genealogical Society has joined forces with genealogy societies and organizations around the country as part of the 1940 U.S. Census Community Project. The Project will make the index to the 1940 census free to everyone. Watch the FamilySearch videos to learn about their indexing program. These include the Indexing Quick Start video and Indexing Tutorial. Also read their Frequently Asked Questions. Although you can’t index the 1940 census until it is released from the National Archives on April 2, FamilySearch has posted two test batches to give you some practice time. These are census images created by FamilySearch for training purposes and are not actual census images. --If you want to index Indiana records, you can index the Indiana County Marriages 1811-1959. Watch the training videos, download a few indexing batches and be sure to join IGS as we partner with other genealogy societies and organizations to make a free index to the 1940 U.S. Census. The Indiana Historical Society will present a workshop, "Find Your Jewish Roots," at the Jewish Community Center of Indianapolis on Sunday, March 25 from 2 to 4 pm. Judi Silverman will share the sources and websites that can help you find information on your Jewish ancestors. You'll learn tips for how to use the information in census records, passenger arrival records and more. Indiana librarians can receive 2 LEUs for attending. Registration is $10 for the general public; $8 for members of the Jewish Community Center or the Indiana Historical Society. To register, register online or call (317) 232-1882. I am looking for information on the William John MILLER family. He lived in Indiana in 1844. William was married to Merilda Elizabeth HARTSOCK on April 11, 1844 in Owen county IN. They had around seven children: John N. , Daniel O., Elizabeth R., Ludwell James, Hugh F., Alonzo Riley, and William P. They moved to northern Missouri about 1860. Both William and his son John served in the Civil War on the "Union" side. I specifically would like exact birth dates of the children and any spouses that may exist. Also, I am interested on information about William's father- James F. MILLER and his wife Harriet. Looking for information on a Joseph KEATH who lived in Boone County, he was Methodist minister according to the census. His father-in-law was a judge by the name of William ELWOOD. Who was in Boone Co. to be near his daughter. They may have moved to Iroquois County, Illinois in the 1880s. Perhaps they moved after William Elrod died. Looking for a marriage and divorce record for James Huston and Mary Ann (DEMING) MILROY from Hancock, County IN. I'm also wanting information on the baptism record of their daughter Mary Jeanette MILROY. Would like to know if there is an guardianship record for Mary Jeanette after the divorce of her parents. I'm in need of burial information on Isabelle (Houston) MILROY. And a photo of General John MILROY grave. Thank you for any help that you may give. The Indiana Genealogical Society now has 748 databases in the Members Only area. They cover all 92 Indiana counties and encompass 500,000+ records. Registration is $15 for Pal-Am members, $20 for non-members. For more information, please visit their website. FamilySearch has updated the Indiana marriage index 1811-1959 that is in progress. Entries from LaGrange County and Lawrence County have been added; 38 of Indiana's 92 counties are now included in the index. You can learn more about the 1940 census at http://www.archives.gov/research/census/1940/. Find out what questions were asked, see sample forms, learn what the codes mean, and more. "Get Ready for the 1940 Census!" at the Danville Public Library on Saturday, March 10 at 10:00 AM. The workshop is free but seating is limited - register online at the library's events calendar or by calling the Indiana Room at (317) 745-2604 ext. 140. "Introduction to the 1940 Census" at the Allen County Public Library in Fort Wayne on Wednesday, March 28 at 2:30 PM, Monday, April 2 at 2:30 PM and Saturday, April 7 at 10:00 AM. Please register in advance for this free class. Call 260-421-1225 or email Genealogy@ACPL.Info. "Genealogy Roundtable: 1940 Census" at the Hamilton East Public Library in Noblesville on Tuesday, April 10 at 2:15 PM. No registration is required. "Learning the 1940 Census" at the Indiana Historical Society in Indianapolis on Saturday, April 14 at 10:00 AM. Register online or call (317) 232-1882 for more information. Cost is $10; $8 for IHS members. "Ask The Expert: 1940 Census" at the Carmel Clay Public Library in Hamilton County on Thursday, April 19 at 7 pm. No registration is required. Can’t attend any 1940 census classes in Indiana? Watch the recorded webinar by Thomas MacEntee, "Are You Ready for the 1940 U.S. Census Images?" from Legacy Family Tree. It is available for free until March 19, 2012 at http://www.legacyfamilytree.com/webinars.asp. The Wabash Valley Genealogy Society will meet on Monday, March 12 at 6:30 pm at the Vigo County Public Library in Terre Haute. The meeting will be held in the library's Rooms A, B and C. Ron Darrah will present a program, "Dying to Help Out, Too," describing ways to discover records on deceased ancestors. Since very few Americans have a probate file after their death, one must use other ways to find records that might provide information about deceased family members. The meeting is free and open to the public - doors will open at 6 pm. The Wabash Valley Genealogy Society serves the interests of several counties in western Indiana: Clay, Parke, Putnam, Sullivan, Vermillion and Vigo. The LaGrange County Genealogical Society will meet on Tuesday, March 13 at 6:30 pm in the genealogy room of the LaGrange County Public Library. There will be an informal presentation on how to organize your family information on paper - family group sheets and pedigree charts will be the focus. You are welcome to bring your family information with you so that volunteers can assist you. The public is invited, especially youth who are interested in a 4-H genealogy project. After the presentation you are welcome to browse the genealogy room collection. For more information, please contact: LaGrange County Genealogist Barb Mulholland - bmulholland@embarqmail.com, phone (260) 854-4311 OR society president Dalonda Young - dalonda@kuntrynet.com, phone (260) 463-6384. More advanced programs will be offered in the future. The Genealogical Society of Marion County in Indianapolis will view and discuss webinars at its next meeting, to be held on Saturday, March 10th from 1 to 3 pm at the Crown Hill Cemetery Waiting Station (Boulevard at 34th Street, East Gate). Webinar is an abbreviation for "web-based seminar" - a method of education that is being increasingly utilized by various vendors including Ancestry and Family Tree University, as well as societies and professionals. At this meeting, Terry Prall, Programs & Education Director for GSMC, will lead a viewing and discussion of selected webinars, including "Navigating the 1940 Census" and "Organizing and Sharing Digital Images." The Indiana Genealogical Society has added the March 2012 issue of Indiana Genealogist, the society's quarterly publication, to the IGS Records section of Members Only. The Indiana Genealogical Society's Seminar at the Allen County Public Library in Fort Wayne on Friday, April 27, 2012 has been approved by the Indiana State Library for LEU credits. Indiana librarians who attend the seminar will receive 1 Technology LEU (TLEU). The seminar is being held in conjunction with our annual Conference and offers a relaxed, interactive atmosphere with a morning open forum/show & tell about what's going in our counties and an afternoon session where you are invited to brainstorm about your research brick walls and consult our Ask the Experts panel. GenWishList blogger Tina Lyons will offer a session about how the power of social media (blogs, Facebook and Twitter) can be harnessed by genealogical and historical societies. We've also built in some time in the schedule for you to do a little research at the Genealogy Center. Registration is just $5 - register online or print out & mail in the registration form. The Allen County Genealogical Society of Indiana will present a beginner’s workshop, "Getting Started in Family History & Genealogy Research," on Saturday, April 14 at the Allen County Public Library in Fort Wayne. The three-hour session will start at 9 am in Meeting Rooms A-B. Instructor Marge Graham will discuss how to gather and organize your information for best results, and how to use proven basic research methods. Participants will tour the Genealogy Center and learn about available resources. The Indiana Genealogical Society has added databases of Brown County tax lists to the County Records section of the Members Only area - thank you to the Brown County Historical Society Archives for sharing them! The Indiana Genealogical Society now has 746 databases in the Members Only area. They cover all 92 Indiana counties and encompass 500,000+ records. The Indiana Genealogical Society has joined forces with genealogy societies and organizations around the country as part of the 1940 U.S. Census Community Project. The initiative aims to publish a free, online searchable name index of the 1940 U.S. Federal Census after images of the census are released to the public on Monday, April 2, 2012. This online index will be free forever, offering family history researchers a rich genealogical data set for their ongoing use. Three leading genealogy organizations, Archives.com, FamilySearch International, and FindMyPast.com, launched the initiative at the end of last year. The index created by the project will allow the public to easily search every person found in the census and view digital images of the original census pages where he or she is listed - all for free! The “Register for a New Account” button will take you to the FamilySearch website to set up your account. Fill in all the information. Join the IGS group by e-mailing your username to Vice President Tina Lyons at genwishlist@gmail.com. Alternatively, you might see a drop down box when you register that will allow you to select IGS as your society. Tell the 1940 U.S. Census Project that you want to help by entering your e-mail, name and favorite state at http://the1940census.com. This will let them know how many people are available to index and keep you informed about the project through e-mail. Now that you have a FamilySearch account, the FamilySearch Indexing software and have added your name to the Indiana Genealogical Society’s efforts, it’s time to start practicing your indexing. We’ll have more blog posts soon to help you get started! The Hamilton East Public Library in Noblesville will hold a workshop, "Searching Census Records," in the library's genealogy classroom on Saturday, April 14 from 9:30 am to 12:30 pm. You'll learn some of the history associated with the census and the basic information that is found on census records. You'll also see how to track a famiy over time and determine family relationships, as well as use the information from the census to research in other records. The Indiana Genealogical Society now has 742 databases in the Members Only area. They cover all 92 Indiana counties and encompass 500,000+ records.